Within the framework of training activities on prevention held regularly by Mexico, a seminar entitled “Tools for the Education of Armed and Security Forces with a Focus on Prevention” was held on Wednesday, April 27, 2016 in Mexico City. 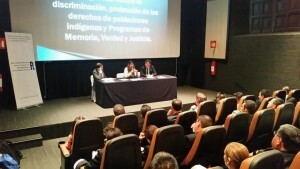 Organized by the Mexican Intersecretarial Commission for International Humanitarian Law (CIDIH Mexico) and the Auschwitz Institute for Peace and Reconciliation (AIPR) in collaboration with the United Nations Office of the Special Adviser on the Prevention of Genocide (OSAPG), the event was delivered to an audience of over 100 people. The seminar worked to create an opportunity for the dissemination of information and reflection on the importance of training in Human Rights and prevention of atrocities for personnel of the Armed Forces and security services at the national and regional level. The training was led by presenters with a high level of experience and involvement in human rights and the prevention of genocide and mass atrocities, including representatives from the Mexican Naval Secretary, and the Uruguayan National School for Peacekeeping Operations and the Regional Delegation of the International Committee for the Red Cross for Mexico, Central America, and Cuba. This seminar afforded participants a detailed illustration of the concepts of genocide and mass atrocities from a historical point of view, as well as a review of applicable international standards. The preventive role of armed and security forces was addressed as well as the relevance of including these themes in the training strategies for officials working in the security sector. Additionally, in keeping with the spirit of cooperation that inspires the work of the Latin American Network for Genocide and Mass Atrocity Prevention, a segment of the seminar included a presentation of the challenges faced by the Uruguayan National School for Peacekeeping Operations in relation to the role of Peacekeeping Operations in prevention strategies. This doubtlessly functioned as an opportunity for interaction and the exchange of concrete experiences related to prevention.